Nucor Corporation (NYSE:NUE) along with its affiliates is engaged in the business of manufacturing of steel and steel products, with operating facilities and customers primarily located in North America. The Company operates in three business segments: steel mills, steel products and raw materials. 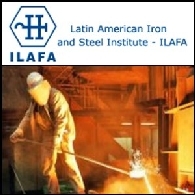 During the year ended December 31, 2009, the Company recycled approximately 13.4 million tons of scrap steel. The principal products from the steel mills segment are hot-rolled steel (angles, rounds, flats, channels, sheet, wide-flange beams, pilings, billets, blooms, beam blanks and plate) and cold-rolled steel. Principal products from the steel products segment are steel joists and joist girders, steel deck, fabricated concrete reinforcing steel, cold finished steel, steel fasteners, metal building systems, light gauge steel framing, steel grating and expanded metal, and wire and wire mesh.